JNN 23 Mar 2014 KARACHI : As the Taliban and the Present Nawaz Shariff’s PML – N Govt , on the Orders of their Saudi Masters are ready to Play a new game with the Pakistani Nation , In the Name of Negotiation , while on the front have declared Ceasefire , but on the Other hand the Shia Target Killing has accelerated , which is also quite evident from the Below given Detailed Report . On 22 Mar 2014 An investigation officer of the National Accountability Bureau, Sindh, and a boy were Martyred in Sharfabad area on Saturday night, police said. New Town SHO Inam Husain Junejo said DSP Agha Jamil was having dinner at a restaurant when Taliban Terrorist on a bike opened fire, leaving him and a woman and her 10-year-old son, Faizan, injured. The NAB officer and the boy both Breathed Last in hospital. NAB spokesperson Qudsia Kadri told Dawn that Agha Jamil had come to the bureau from the Sind police department on deputation around one and-a-half years ago. He Had also served as the SHO and the DSP of Different areas . On the same day , Hours Earlier in another attack the brother of an Imambargah trustee were shot Martyred here on Saturday night, officials said. At Kazmain Imambargah Gulbahar area , Near Rizvia Society a shopkeeper was Martyred Police said Shujaat Hussain, 24, was sitting in a general store along with his friend Taufiq Hussain when TTP’s Terrorist Sleeper Cells Terrorist on a motorbike attacked them with a 9mm pistol. They were taken to Abbasi Shaheed Hospital where Shujaat was pronounced dead. Tension gripped the locality after the incident. SHO Mazhar Iqbal said it is a sectarian attack. The Funeral Prayer of Shaheed Shujaat Ali Rizvi was held On Sunday 23 March After Namaz e Zohrain at Old Rizvia Imambargah . Shujaat was brother of Rizvia Imambargah trustee Amjad Shah, a spokesperson for Majlis-i-Wahdatul Muslimeen said. He criticised & Condemned the government for its failure to stop the Accelerated Shia Target Killing , while the Government is Negotiating with the same terrorist Organisation , Instead of Punishing and apprehending them . On Mar 20 ,The Terrorist of TTP Attacked and Martyred another Shia Police official in Karachi on Thursday. As per our Correspondent Anwar Jafari was on way back to home along with his gunman when the terrorists of TTP ambushed them near Coast Guards Chowrangi in Korangi. He was an active police official during Karachi Operation and nowadays he was posted in Crime Branch of Police. He Earlier Served the Sindh police as Station House Officer and promoted to the rank of Inspector but he was among those many officials who were demoted On the Orders of the Supreme Court to their Original ranks, hence He was Presently working as head constable now. Anwar Jafari is said to be custodian of an Imam Bargah also. 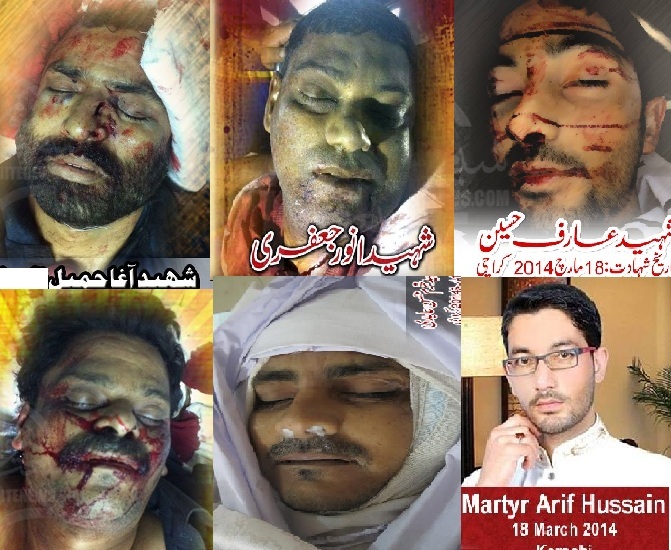 Same Day another Shia notable embraced martyrdom due to the target Killing of the Taliban in Khairpur. As per Our Correspondent reported here that the Terrorist of TTP allies of SSP and LeJ targeted and attacked Mir Manzoor Talpur at Asgharia Chowk Panj Hatti area of Khairpur. Due to the firing He embraced martyrdom on the spot. The Unfortunate Incident took place as the Shia Activist and Supporters and members of Majlis-e-Wahdat-e-Muslimeen were Busy in the Graffiti Writing on the Walls for the Upcoming Labbaik Ya Rasoolullah (PBUH) Conference , scheduled to be held in Khairpur . The Activist were attacked by the Takfiri Taliban Terrorist , and due to their Intense sporadic firing , about 9 of the Shia Young Men were Injured , while Manzoor sccummb to his injuries and embraced Martyrdom on the spot. The Takfiri Taliban , which has their own Religion , who name it as Islam , in which they Not only Oppose Upholding Mehfil e Milad and Religious Events , In which True Muslims Highlights the Great Noble Personality of Our Last Prophet Muhammad ( PBUH ) , while on the contrary they even Disgrace Our Last Holy Prophet by saying that He could not have a Meeting in Person with the Great All Mighty Allah in the Event of Mairaj , while they propagate their Belief that it was Only a Dream and was spiritual rather than In Person . Khairpur was an Autonomous Princely state with Majority of Shia Population, as Shia dynasty of “Mirs” ruled this state for ages . Now, it is part of Pakistan after the Independence of Pakistan under an agreement by Mirs and Khairpur’s official name is Khairpur Mirs. On Mar 19 , 2014 Another Shia doctor Dr Babar Ali was targeted by the terrorist of SSP , the allies of TTP , in Hasan Abdal , District Attock of Punjab Province on Wednesday . MWM Attock Secretary General Maulana Niaz Hussain Bukhari deeply condemned the Target Killing of Shia Dr. and asked Govt to apprehend the Killers and award them the Capital Punishment , by Publicly Hanging them By the Noose , instead of Negotiating with them , which is being done to Appease their Saudi Masters. On Mar 18 Notorious Takfiri TTP terrorists of banned Sipah-e-Sahaba/Ahl-e-Sunnat wal Jamaat shot martyred a Shia teacher in Karachi on Tuesday. As per Our Correspondent Takfiri TTP terrorists , Belonging to Lashkar-e-Jhangvi attacked and opened fire upon Arif Hussain s/o Mohammad Sharif, 25, in Manzoor Colony , Karachi . Due to the Intense firing , He was critically Injured and was taken to the Hospital , where he succumbed to his Injuries , and embraced Martyrdom. On Mar 17 the Outlawed Takfiri Terrorist of SSP , the Political Wing of TTP Targetted a Young Shia Man Khurrum Hassan Abdi s/o S. Mohd. Hassan, 30 in District Central , On Sunday Night. As per Our Correspondent He was ambushed Near People’s Chowrangi between North Nazimabad and Federal B Area. Due to firing, Two Men were Injured , who were rushed to the Hospital , but Khurrum was Pronounced Dead on Arrival . He was working at Mobile Phone Sales Shop , in the Sareena Mobile Market . After Medico Legal formalities , the body was shifted to Imambargah Shuhuda e Karbala , Sadat Colony , F.B. Area ,for His funeral , which was Performed after Zohrain Prayers . He was also the Resident of Sadaat Colony ( Incholi ) . On Mar 15 the Takfiri Terrorist Belonging to TTP’s , International Terror Squad Lashkar e Jhangvi , has Kidnapped a Shia Man Shaukat Hussian s/o Hussain Baksh from Dera Ismail Khan on Thursday . On Saturday, His Body was recovered who was Martyred By torture by the same terrorist . On Mar 11Another Shia Man Fazal Abbas , 35 embraced martyrdom in a targeted attack by Takfiri terrorists of Ahl-e-Sunnat wal Jamaat, (ASWJ / SSP ) in Karachi on Tuesday night. As Per Our Correspondent Abbas was targeted and attacked near Fazal Mill, Rashid Minhas Road , Federal B Industrial Area. He embraced martyrdom on the spot due to firing. Body was shifted to Hospital for Medico legal Formalities. On Mar 11 Another Shia businessman Naeem Hussain Jafari was Martyred by the Takfiri Terroist of Sipah e Sahaba Pakistan Local Associates of TTP in Liaquatabad Area , District Central Karachi , on Tuesday. As Per our Correspondent SSP Terrorist stormed into Naeem’s Shop Jafri Optical and fired targeting him , due to which he was fatally Injured . He was shifted to the Hospital , but could not survive and breathed his last on the way. Jafari Optical is situated near Markazi Imambargah , Baab-e-Fatima (AS) on main road of Liaquatabad but the terrorist fled Unhindered after the Brutal firing , which is a Big Question Mark on the Vigilance and Petroling of all the Responsible LEA’s. As Per our Correspondent on late Monday night the takfiri terrorists Barged into an Estate agent’s Office in sector 5 M New Karachi, and opened fire On its owner Akhtar Hussain Alias Akku Bha , Due to which he embraced Martyrdom on the spot. Beside Being an Estate Agent he was also associated with a Local Poltical Party , which has its clear Cut stance against Taliban and their Associates . He was the Resident of North Nazimadad. On Mar 10 another Shia Man Iftikhar Hussain s/o Ghulam Sarwar, 40 was shot Martyred outside his residence, by the same terrorist of TTP in the Sarki area of Peshawar , Capital city of Khyber Pukhtoonkhwa province on Sunday night. Mar 07 The terrorist of TTP who are enemies of Sunni and Shia Both targeted two Men namely Ali Naqvi and Sunni Friend Hammad , in Gulbahar Area , of District Central , Karachi . Both were targeted and fired Upon due to which they were fatally injured and rushed to the Hospital , but could not succumbed to their Injuries and embraced Martyrdom , On Friday Night . Both were Members of Karachi Based Political Party , MQM, which has a clear Anti Taliban Agenda and Openly Condemn and denounce them. While it should also be noted that Both the Martyrs were in receipt of the threats from the Sipah e Sahaba Pakistan , but Bravely rejected their threats. Same elements came to the Reti Pharah area of Nusrat Bhutto Colony in the early hour s of the day and Opened fire upon Manzoor , due to which he embraced martyrdom on Wednesday. Mar 03 Another Shia Shahid Ali s/o Shaukat Ali was again targeted by the Local Taliban Present in the Illegal settlements of Karachi on Monday night , in the Manghopir Area. He embraced Martyrdom on the spot , his Body was shifted to the Local Hospital for Medico Legal formalities. These Illegal settlements of Karachi has become the Vast Nursery and Sanctuaries of these Taliban elements , which have even been Highlighted but the LEAs are reluctant to take decisive action against these Nurseries of the Terrorists ,due the Unwillingness of the Political Leadership of the PML – N , which is working on its Agenda to give them a Safe Passage , and if gets a chance , to give these terrorist Networks a Political cover and a Place in the Government Set Up , as it was earlier done by the Former Dictator and traitor of Pakistan Zia Ul Haq , who did not only sold the Prestige and Honour of Our Mother land , for the Interest of his American and Saudi Pay Masters. As Now due to the Active Social Media and Under Pressure of it Even the Main Stream Media has to Ask Questions from the Present Sitting Govt of Nawaz Shariff , why they are accepting Bribery Cash Deposit from the Nations like Saudi Arabia , In the name of Friendship and Help, as they have even Past , Used us like Sacrificial Goats and has Not only sacrificed Us , but have ruined our Honor and Prestige as a Most Powerful Islamic Nation of the World. And as now whole of the Nation regardless of Sect or Ethenicity condemns these Fraudulent acts of Saudi and US , who have given the Pakistani Nation , Just Misery and Chaos . The Only Good thing which has come up in the recent Past that Now even the General Pakistani Public and even the Wise Leaders have become aware of the Nefarious Designs of these Ruling Class , who have been Brushing Terrorism Under the Carpet , on the Pretext of Sectarianism . And now the Majority of the Population of the Sunni and the Shia Sects of Pakistan are United and Condemn the Taliban and their allies and clearly term them as Terrorists , and Traitors of Pakistan . This entry was posted in Asia Pacific, Jafria, Pakistan News and tagged Anwar Jafari, Imambargah, Karachi, pakistan, Shaheed Shujaat Ali Rizvi, shia, shia Target Killing, Shujaat Hussain, SSP, taliban, TTP, Young Shia Man Khurrum Hassan Abdi. Bookmark the permalink.